I am so pleased to share these photos from Sheila Hancock. 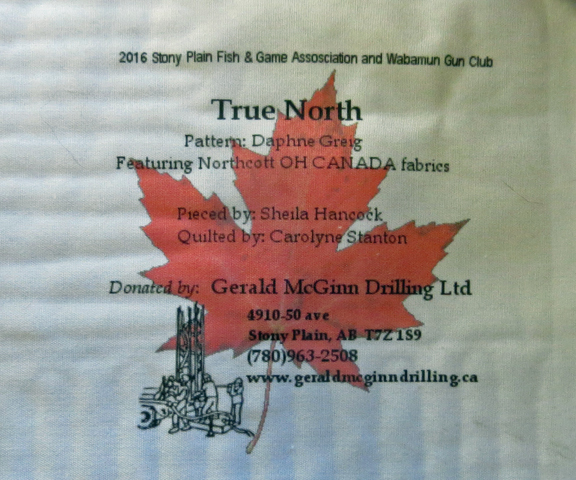 This quilt was made and donated the the Stony Plain Fish and Game Club and Wabamun Gun Club, for their dinner and silent auction. The pattern is True North and the fabrics are Oh Canada from Northcott. 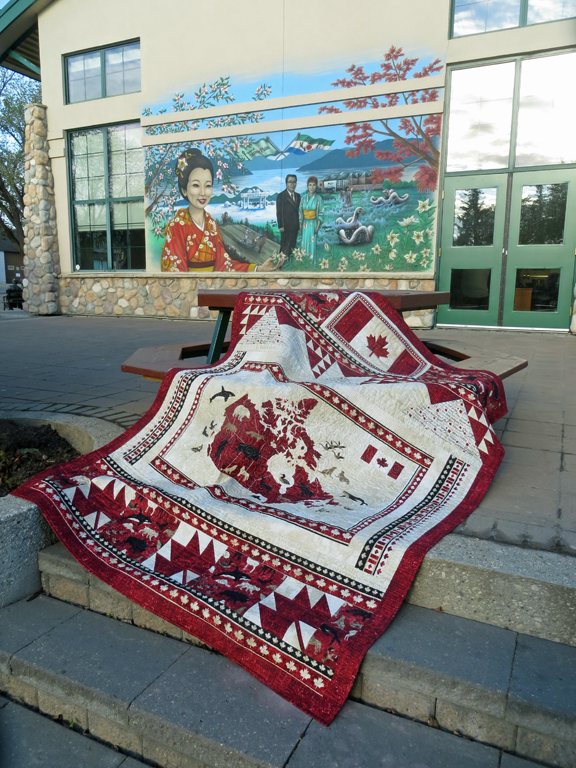 Read below the pictures for more about Stony Plain and it's Sister City in Japan. I live in a town called Stony Plain. In our community there are several murals painted on buildings throughout the town. This mural was made and painted on the Town Office Building to honour the Friendship between the two communities. In the mural are both Mayor of Shikaoi and the then Mayor (Donna Cowan) of Stony Plain. The Town of Shikaoi, Hokkaido, Japan, and the Town of Stony Plain, Alberta, Canada have been sister city's for 30 years. The year 2015 marked the 30 year anniversary of our two towns twinning, and I had the pleasure of traveling to Shikaoi, Hokkaido, Japan, as an adult delegate. February 2015 22 people from our town (Our current mayor William Chow, a couple of Councillors, past mayor Donna Cowan, Representative from the County of Parkland, Town employee's and 11 selected people from our community) travelled to japan, to join in the 30 year anniversary celebration. While over there, our experience was amazing, and the community and all of their people treated us like royalty. They are very hospitable people, loving and kind. Their town is a population of 5,000 and they have a farming community surrounding them. They have seasons and weather very similar to ours, but I believe they receive more snow. They are in the mountains, but not like our rocky mountains. The views are amazing. They grow a lot of lavender and a lot of potatoes, the skins are light/thin, amazing flavour. Dairy is also a big industry for them. I am not fond of dairy, but their dairy is amazing; the yogurt tastes like ice cream. I could go on forever about the experience. The memories will live a lifetime in my mind and with the thousands of photo's I took. ANYWAY.... That is why I selected that area of our Town to take the photo, to have the beautiful mural in the background. Thank you so much for sharing the pictures and the wonderful story Sheila. 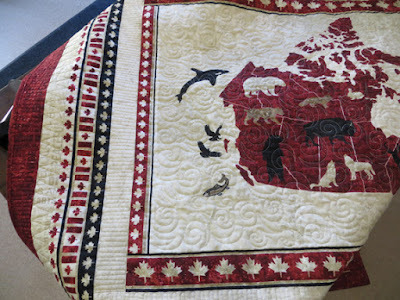 If you would like to make a True North quilt you can buy the pattern here.